In my previous blog post on MCR-1 Positive E coli , I had commented that Total drug resistant TB (TDR-TB), is a misnomer and there probably has never been a case reported as true TDR. I have also argued over why this is so. But, it appears that quite a lot of the readers have a competing opinion. I had a couple of Email's with good arguments and been referred to a paper by Hoffner et al; 2009. There are several pages in WHO site explaining that TDR-TB is not the right term and hence I don't need to talk about it once again. For people who are not aware of TDR Story, here is a snap look. The First two cases were reported from Italy in 2007. The first female case, Case 1 had acquired TB from her mother (Who was diagnosed with MDR-TB). Case 1 was admitted to three different hospitals for a total of 422 days. Case 1 was admitted to three different hospitals for a total of 422 days. The second female case, Case 2 was admitted to two different hospitals for a total of 625 days. Both died in 2003, after multiple, unsuccessful treatment with all possible Anti-TB available drugs without achieving any significant bacteriological conversion. 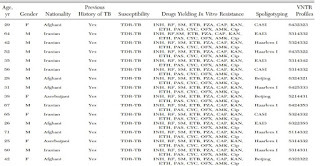 In both the cases, resistance to new TB drugs had been acquired over a very long time and attributed to inappropriate TB regimen. In 2007, US reported the first case of XXDR TB from a young Peruvian man, Oswaldo Juarez who was visiting the United States. After his illness puzzled the doctors he visited he was sent to A.G. Holley State hospital. He was treated with high doses of drugs, which are not normally used for TB. He achieved complete cure in 19 months. Table 1: Patient and Isolate profiles of XXDR TB Isolates. Next report came in 2009 from Iran and Afghanistan. The study characterised a total of 146 MDR-TB strains. 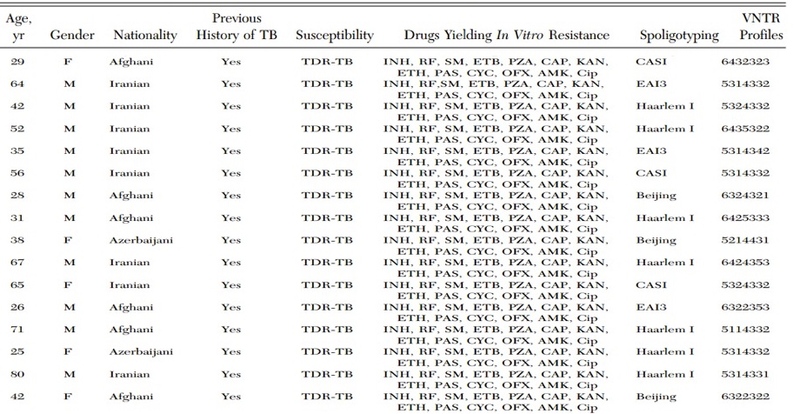 Of these, they found 8 isolates were XDR and 15 strains were TDR isolates (10.3%) were identified. The detailed summary of TDR (XXDR) is shown in Table 1. The next set of reports came from Hinduja Hospital, India. 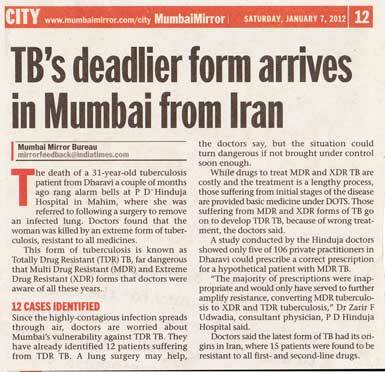 In December 2011, Dr. Udwadia reported four tuberculosis patients resistant to all first and second line TB drugs. By early January, 12 cases were known. 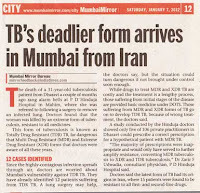 As per the Ministry press release then, "The cases reported by Hinduja hospital fall only within the category of 'extensively drug resistant' TB based on standard World Health Organisation (WHO) definitions and not at all as 'totally drug resistant' TB. Of the 12 patients, nine have been found to be stable on current treatment while three have died." In April 2013, it was reported that of the original 12 patients six had died. The other six responded to medication. Again in September 2013, a teenager case was reported from Kokilaben Hospital in Andheri. In all these cases, WHO has denied naming these strains as TDR but have embraced the term XXDR or XDR plus. Extensively drug-resistant TB (XDR- TB) is a type of multidrug-resistant tuberculosis that is resistant to isoniazid and rifampin, plus any fluoroquinolone and at least one of three injectable second-line drugs. In contrast, XXDR TB or XDR Plus TB refers to a strain, which is resistant to all the first and second line Anti-TB drugs. Naming the strains as TDR implies that the bacilli are resistant to everything. In reality, treatment has been achieved in some cases at least with unconventional regimens leading to the idea that there is some left over sensitivity. There are several other reasons why this term is inappropriate. Raviglione etal has written an extensive article arguing the use of the term. The development of XXDR status in every case has been traced to improper regimen and use of antibiotics. Current recommendations include that both first and second line drugs be tested in the laboratory and then used for treatment.